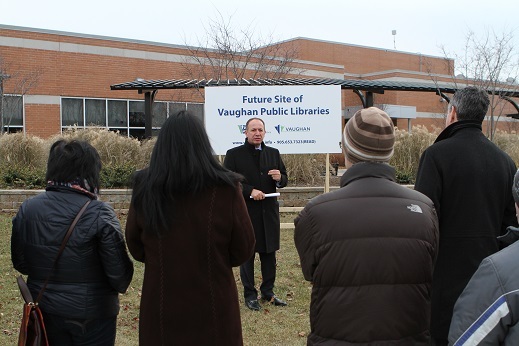 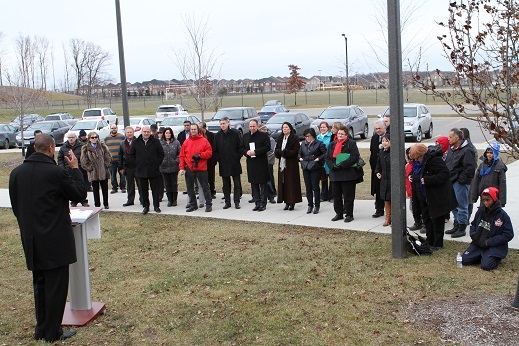 Members of the Vaughan Public Library Board, Mayor and Members of Council were in attendance for the site dedication for Vaughan Public Libraries’ (VPL) new Pleasant Ridge Library, Sunday, Dec. 8. 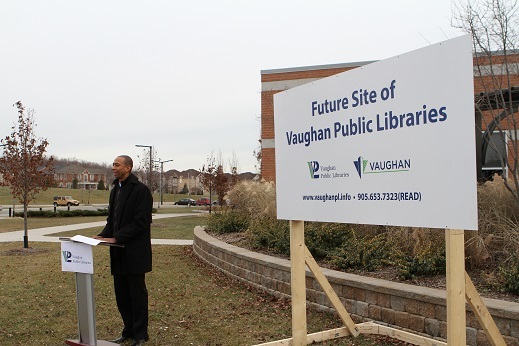 The new 8,500 square foot neighbourhood library will be built as an addition to the North Thornhill Community Centre. 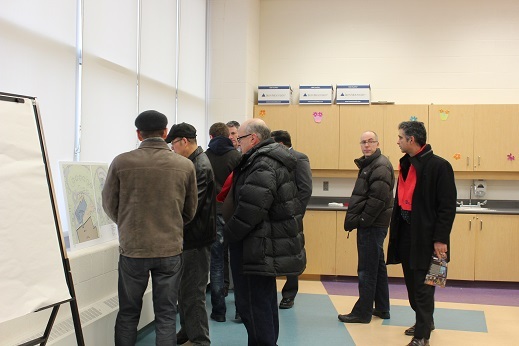 A community meeting followed providing residents with an opportunity to view the proposed design. 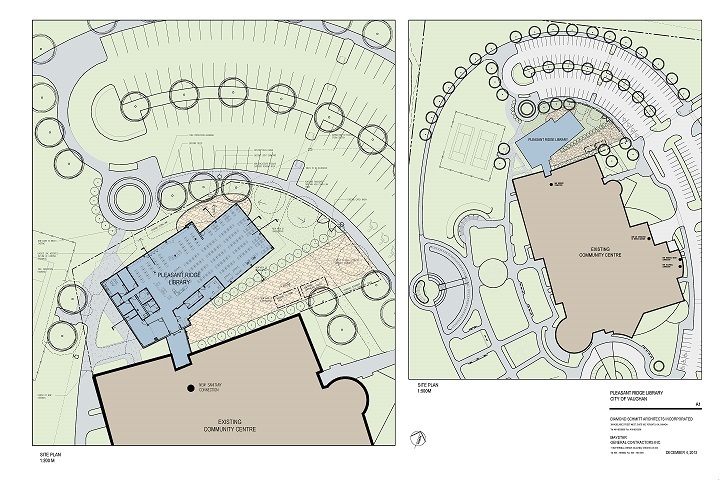 Construction of the new library is expected to begin in the spring of 2014 and be completed by fall. 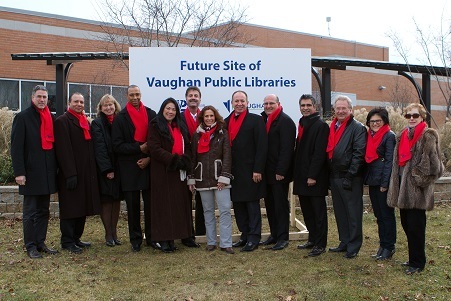 (From L to R) Gary McCluskie, Principal, Diamond Schmitt Architects, Marlon Kallideen, Commissioner, City of Vaughan, VPL CEO Margie Singleton, VPL Board Chair, Michael McKenzie, Ward 4 Councillor Sandra Yeung Racco, Luciano Di Giuiseppe, Project Manager, Maystar General Contractors, Maya Goldenberg, President, former Thornhill Woods Community Association, Mayor Maurizio Bevilacqua, City of Vaughan, Joe Maio, President, Maystar General Contractors, VPL Board Trustee Pradeep Puri, VPL Board Trustee Steve Kerwin, Ward 3 Councillor & VPL Board Trustee Rosanna DeFrancesca and VPL Board Trustee Lorraine de Boer were on-site to dedicate the north entrance area of the North Thornhill Community Centre as the site of the future home of VPL’s Pleasant Ridge Library. 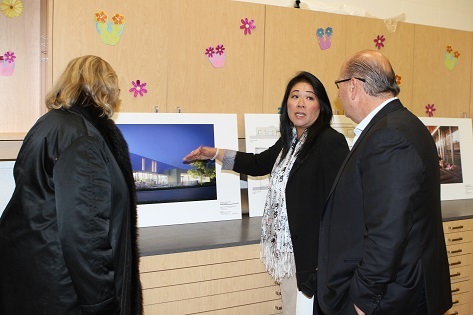 Architect's rendering (exterior view): the spectacular yet tasteful design of the new Pleasant Ridge Library will focus on creating a welcoming destination that uses an abundance of natural light and glass, and features a barrier-free space that is flexible and adaptable. 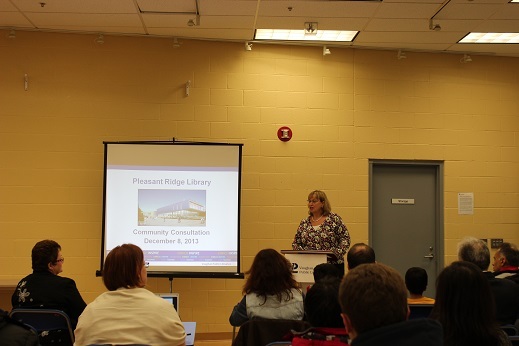 The library will transition seamlessly from the community centre, yet will become a focal point of the community. 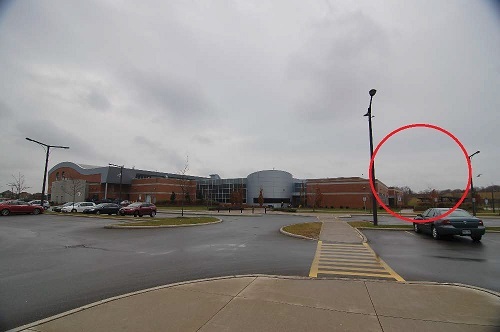 The new library will be located north of the existing community centre building in an area bounded by the existing tennis courts to the west, existing parking lot to the north and east, and the existing community centre building to the south. 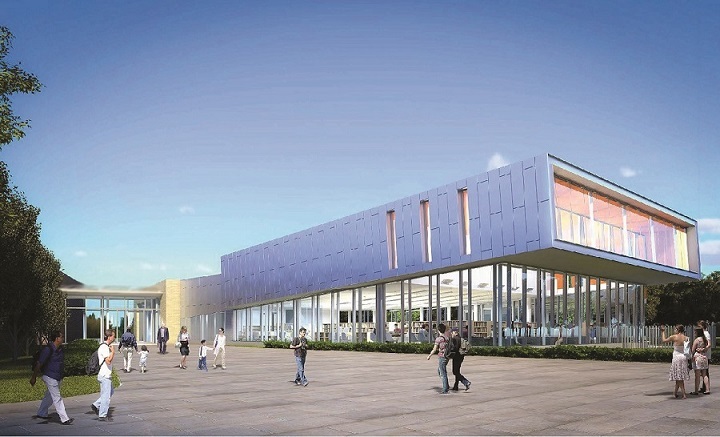 Architect's rendering (reading area): the light-filled reading area is located along the windows of the library. 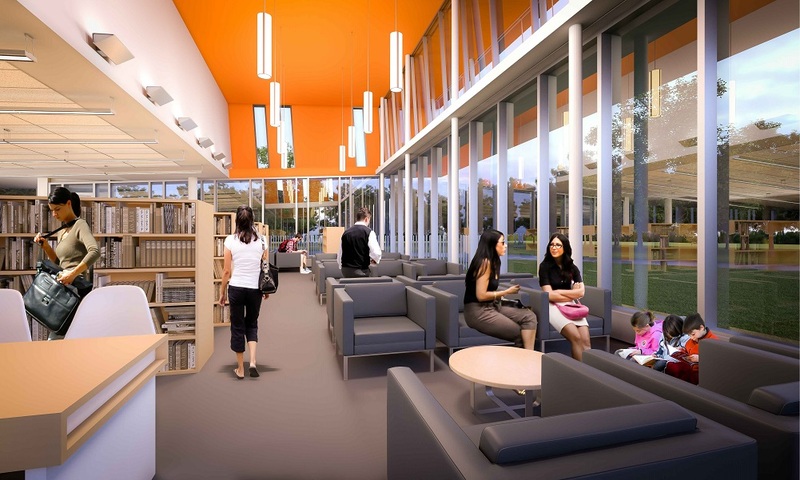 The added ceiling height provides the area with extra volume and light, while the warm colours help to create a great ambiance for reading or interacting with others. 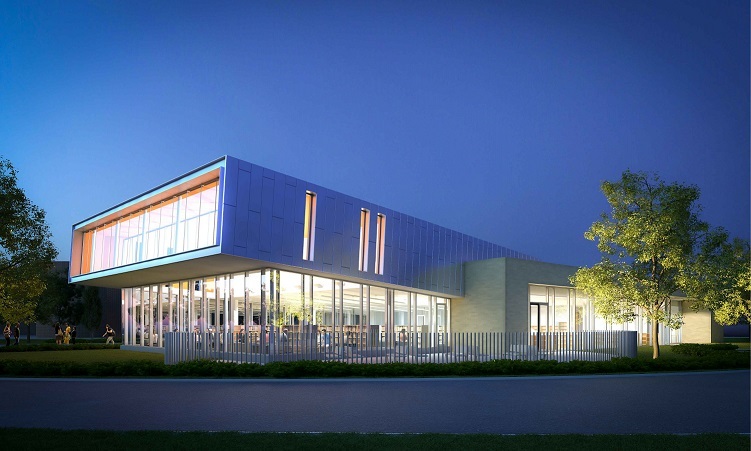 Architect's rendering (night view): at night, the light and transparency of the library will continue to make it a focal point of the community.